More than 5 years in the making… the long awaited sequel to How to Cook Brown Rice is finally here! The Ultimate Rice Bowl is my own special recipe for a delicious vegan/vegetarian meal. It’s the perfect blend of warm, chewy, crunchy, and savory. It’s also very easy to make — no special cooking skill required. This recipe is for a single serving of a very filling meal. If you want to make a smaller or bigger batch, feel free to adjust the ingredients proportionally. Add sesame oil, tamari, and sesame seeds. Use a fork to mix. 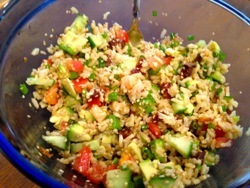 Add cucumber, tomato, sun dried tomatoes, avocado, and green onion. Mix again. You can certainly make this with leftover rice, but I suggest heating the rice first since this dish is best served warm.